Let Your Business’ Windows Do the Talking – with Eye Catching Window Graphics! Window graphics instantly kick up your curb appeal and increase your business’ visibility! From sales promotions to product advertisements, hype your storefront with creative designs that offer real visual impact and impress your audience. We are engaged in providing superior quality Window Signs. These Window Signs are very well printed according to our clients requirements and so that it stay good for longer period. These Window Signs are available in market at most economical rates. 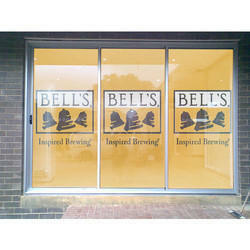 We are an acclaimed name engaged in providing our precious clients a superior quality range of Window Signs. Owing to the presence of our expert team members, we are able to offer a wide range of Window Graphics. Parle has produced some of the most noticed window signage in downtown, san francisco using window cling signage. This material, cling vinyl is opaque and is used in store front and street front windows to advertise a building and to block out the inside of the building which may be under construction on the inside. Etched window vinyl’s are a cost effective method to get the very most out of the windowed areas of your business premises - they can be used to create privacy, provide markings for health and safety compliance, as a unique decorative feature or to re-inforce branding or promote a.